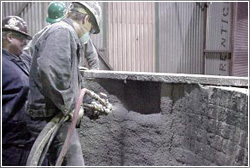 The same features that make Fibercon® steel fibers desirable for concrete construction…resistance to spalling, enhanced flexural strength, excellent impact resistance and lower permeability…substantially benefit refractory applications, including green state. The use of stainless steel alloys makes Fibercon® ideal for high temperature applications. Fibercon® fibers are proven to be of extremely high quality both in terms of metallurgy and dimensional tolerance. To meet the demands of its customers in high temperature processing industries, Fibercon International exacts strict quality control and quality assurance measures to ensure alloy purity and consistency while enforcing the dimensional and physical requirements imposed by ASTM A820/A820M. Raw material is verified for chemical and physical composition prior to use and final fiber shapes are continuously sample inspected for size and aspect ratio. Independent labs confirm our raw materials periodically, furthering our commitment to product quality. A unique contribution of Fibercon® stainless alloy fibers is the bridging of the weak zone in a refractory subjected to a thermal gradient. Refractory strength is high in the hydraulic zone where temperatures average 1400°F (760°C), and in the ceramic zone, where temperatures can reach 1800°F (982°C). While strength can decline sharply between the zones, Fibercon® fibers are designed to sustain refractory strength in this temperature range. Our fiber technology helps extend refractory life and offers added benefits such as outstanding spalling resistance, superb fracture toughness, better abrasion resistance, superior thermal and mechanical shock resistance and uniform alloying characteristics. Use of Fibercon® substantially improves refractory durability and performance, and reduces refractory installation, maintenance and material. To better understand the types of fibers we offer for refractory applications, take a moment to review our product comparison guide. To learn more about Fibercon® stainless fibers in your high temperature applications, don’t hesitate to contact our sales staff for additional help with your project needs. NOTE: ALFA-1™ is a registered trademark of Allegheny Ludlum Corporation, Pittsburgh, PA.
© 2009 Fibercon International Inc., All Rights Reserved.